Earliest October snow fall on record here. Lake effect snow expected from 8pm Thursday through 6am Friday… It’s definitely been dumping on us all night and there’s still thunder and lightning going off and on. Looks like about 10″ on the ground now . The problem is the trees. 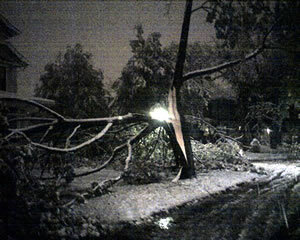 The snow was wet and heavy, and since most trees still hadn’t lost their leaves, the weight of the accumulated snow caught by the trees is pulling the trees down. And the power lines are going with them. 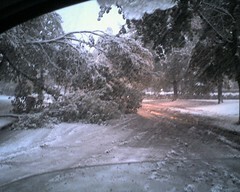 My neighborhood’s trees have just been devasted! The destruction is horrifying and all you can hear outside is frequent cracking, splitting and thuds as the trees lose major parts under the weight of the snow. I just want to cry. Fortunately, I still have power but perhaps not for much longer. The power line supplying my house has a tree limb resting across it and we’ve a few flickers already. Cable TV is gone.